The design of the Lady Nessalyn butterfly Swarovski earrings feature butterfly made with 8mm Swarovski white pearl and crystal beads. 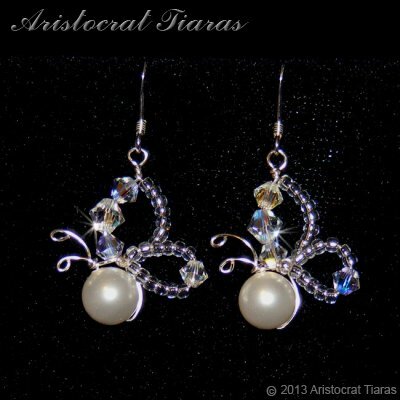 These crystal earrings from Aristocrat Tiaras are specially created to match Lady Pearl butterfly necklace and to compliment our bridal tiaras such as Princess Aurora tiara. The butterfly earrings create a nature feel and are a truly unique piece of Swarovski jewellery for a bride on her wedding day.